Villa Aksel is a brand new house in the middle of nature but within walking distance to Kas and Büyük Cakil beach. It is the perfect place to relax. When my wife and me first came to Kas in 2002 we instantly fell in love with Kas. Kas is a small village with much charme and without any mass tourism. It has preserved its original flair and offers lots of tiny places to sit, eat or just relax. People who visit Kas are individualists who are interested in sports, romanticism and culture or want to combine a little bit of it all. When we in 2004 decided to later completely settle down in Kas we built an appartment which we successfully rent since then. In 2010 we started our project to build this house. In total it comes whith 200 sqm living space and a spacious outside area. It is subdivided into two units which we rent out seperately as Villa Simena and Villa Kekova. This is your unique oppotunity to rent them both together at an acceptable price and enjoy all advantages of complete privacy. The house is only built with natural materials like stone, wood and metal. All materials are ecologically correct. It was our intention to built in accordance with the surrounding nature whilst offering our guests the maximum in standard they expect. The villa comes with 200 sqm living space in total subdivided in 2 x 100 sqm with own entry. For your comfort we offer you 2 outside showers, 2 barbecues, a hammock, an original Osman sitting corner, a breathtaking seaview and the perfect sunset. The approx 150 sqm terrace and the 4 x 8 m private pool offers much of room which invites you to relax on wooden deck chairs provided. Surrounded is the Villa by a beautiful garden. We designed it in a way that it is completely fitting into the nature arround. We are pretty much sure you will like it. In summertime you will enjoy a glass of wine on your terrace whatching the boats going by and listening to the sound of nature. In autumn and winter times the Villa is perfect to relax inside whith 2 open fireplaces that keep it warm and romantic. Most of the lights the villa are original Osman style and will let you feel that you are really visiting the orient. And if you look for entertainment you will enjoy the 2 HD TV sets or use the DVD players which are available in the house to watch your own films. In fact, Villa Aksel is the perfect place for 2 couples or for parents who would like to spent their holidays together with their adult childrens family. This is just a proposal. In fact Villa Aksel is the ideal place to spend holidays together for up to 12 people. The house has a private pool. 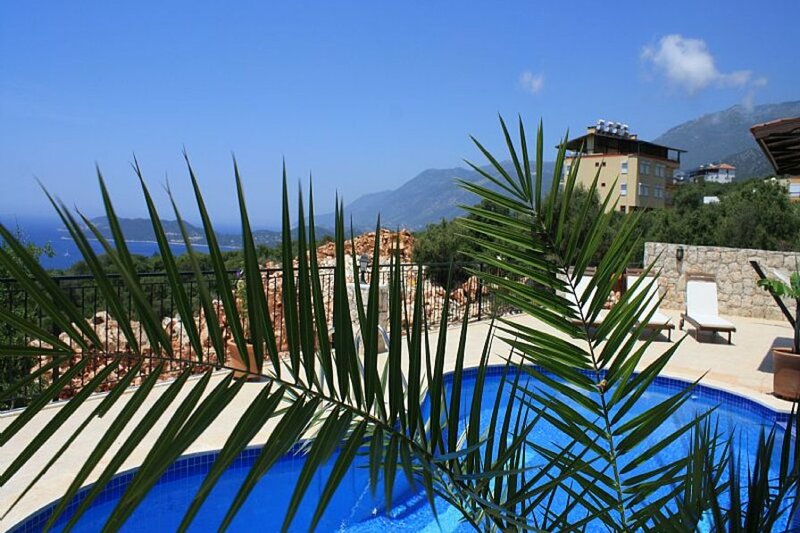 The house has a sea view as well as a view on the beautyful mountains surrounding Kas. An iPod Docking Station is available in both houses. A baby bed and a baby bathing tub can be offered on request. 2 playstations 2 are available including games like SingStar and Kinetik or EA Sports 2. Each house comes with a Cold-/Hot water dispenser. Smoking is allowed on all terraces and balconees. Please note : The Pool is operated only in the months April to October.